Your students may come in to your classroom at the beginning of the lesson with their previous subject still on their mind. Therefore, we need something to get them thinking in English, to make our lesson more effective. It may be a review of the previous lesson, a topic connected to today’s lesson, or simply something fun to put your students in a positive mood. There is a very well-known quote from Benjamin Franklin, and it says: “Tell me and I forget, teach me and I remember, involve me and I learn.” By eliciting language from students, we are involving them in the learning process. By being involved, there is a bigger chance that they will learn more effectively than if the teacher simply stood at the front of the room and told them everything, lecture-style. Drilling often comes in for some unfair criticism, perhaps for its repetitive nature, however, students do need to hear how a new word is pronounced, where the stress is, the presence of any weak forms, the presence of silent letters etc. As well as hearing the pronunciation, students need a chance to practice saying the word. By drilling, we are drawing students’ attention to pronunciation, an issue which is often overlooked. And finally, as teachers, if we don’t teach pronunciation to our students, it makes it more difficult to correct our students when they mis-pronounce a word. Teaching English is different from teaching other subjects due to its communicative nature. Our students need communicative tasks in class, but this very idea of in-class communication may be unusual for some students. Therefore, when we set up tasks, we need to give very clear instructions. Instructions should be brief, always provided with an example or demonstration, and most importantly, we need to check that students understand what to do. Instructions Checking Questions are questions which test whether students have understood the task, and some examples are: Are you going to write or speak? Where do you write the answers? How long do you have for this task? How many questions are you going to ask your partner? We know how much our students have understood based on the way they answer our ICQs. Lead-in stages are important not only at the start of the lesson, but they are actually needed for eachtask. Again, this is to create interest in the task and to ‘warm students up’ to it. Lead-ins may simply be asking questions about the task / context / characters / grammar point etc, but the aim is to prepare students for what they are about to do. When dealing with the 4 skills, it is important to look at how we can make our students better in all of these areas. Sometimes reading and translating don’t always develop our students’ reading skills. Instead, training them to skim – to read a text quickly – is effective, as it makes them more reliant on English rather than on their first language. When practicing reading tasks, it is also a good idea to set time limits, so that students don’t waste unnecessary time checking the meaning of unimportant words in their dictionaries. The three main stages of a language lesson: Presentation, practice and production. The main point which is often overlooked / forgotten about in the presentation stage, however, is pronunciation. As with vocabulary, it is important to make students aware of pronunciation issues with things like contractions (I’ll / I won’t / I’ve been etc), confusing pronunciations like can / can’t etc. Most of us teach large classes, with 20 or 25 students. The only way that we can be sure that they communicate in our lessons is for them to have opportunities to work in pairs, speaking, or communicating with their partners. Yes, students will make mistakes, but that is part of the learning process, but they will get opportunities for speaking English. 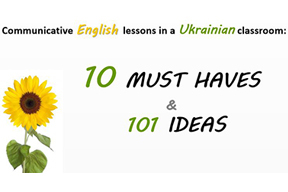 Students may speak Ukrainian, but with frequent gentle reminders of our classroom rules, the English speaking culture eventually does set in. Sometimes in class we need some time out, a break from the constant grammar and vocabulary. Such time out opportunities can allow us to do something a little different, be it watching short DVDs or learning something interesting about the world. As long as there is English practiced, it is a good thing. Furthermore, if we can link time out puzzles with the grammar / vocabulary topic of our lesson, then it becomes much more effective. Support is important in any career if we want to develop and make progress. We hope that the Teacher’s Companion component to New Challenges 1 can help you with this. Whether you are a new teacher, whether you want to refresh your knowledge or whether you are an experienced teacher looking for material to use for training / developing your younger colleagues.